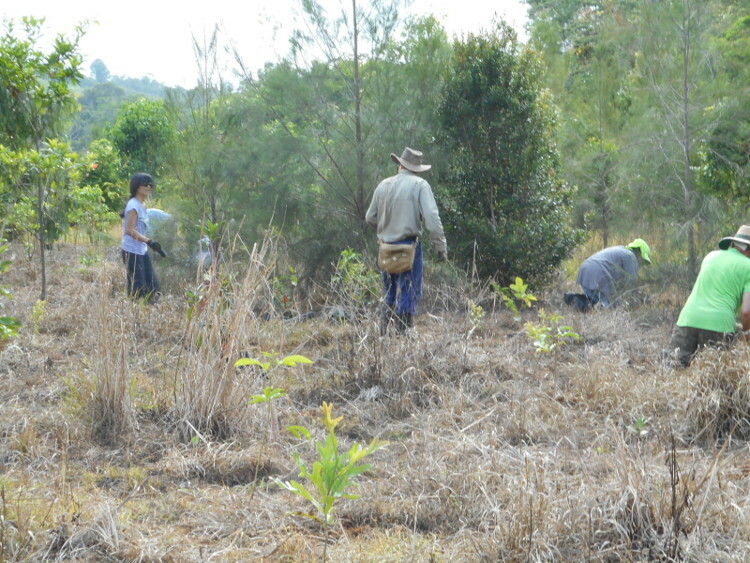 There are 10 community plantings scheduled for this wet season, taking place each Saturday from the beginning of February through till the middle of April, with a break for Easter. A total of 22,000 trees are to be planted. Students from the School for Field Studies will help at four plantings - two at Rock Road, one at Hoare's and one at Emms'. The Rock Road and Massey Creek plantings are continuing revegetation of corridor areas from previous years. The plantings at Hoare's are strengthening the Peterson Creek corridor west of Lake Barrine Road. At Holmes' the planting will enhance vegetation along Leslie Creek and at Kilpatrick's the planting will be on a new area at Leslie Creek closer to McKeown Road. At Clarkson's the planting is strengthening vegetation within their Nature Refuge area. At Emms' the plantings are joining areas previously planted in 2015. Trees for the plantings are sourced from QPWS, TRC, NQLMS and Emms. QPWS is supplying trees for the QPWS planting, TREAT's plantings and 2,000 for BCC's plantings. TRC is supplying trees for SET's Rock Road plantings, and 1500 for Clarkson's planting. NQLMS is supplying 1200 trees for BCC and a few for Emms, and Emms are supplying most of their trees from their own nursery. TREAT is supplying 300 trees to the Clarkson's planting from part of TREAT's allocation of trees from QPWS. Site preparations will be done by NQLMS at Rock Road, the BCC plantings and at Emms'. QPWS will prepare their own site, as will John Clarkson, and TREAT's plantings at Hoare's will be prepared by Mark McCaffrey. Maintenance of the TREAT and BCC plantings will be supported by CSAG grants, as will one of the Emms' plantings. Beards On have donated $10,000 to support maintenance of the other Emms' planting. The barbecues after the plantings are organised by TREAT, with 2 teams operating alternately. They are much appreciated, as are all the volunteer planters who come along, many of them to all the plantings. We hope the weather will be favourable. Vast areas of livestock pasture have been created by felling rainforests worldwide. Therefore, grazing land provides significant opportunities for forest restoration. Rainforests can sometimes re-establish readily through natural regeneration. However, these regeneration processes are often stalled or slowed after grazing is reduced, because the dense cover of highly competitive fast-growing introduced pasture grasses and legumes resists tree re-establishment. And there are further impediments to natural regeneration; first because many rainforest tree species produce fleshy fruits, so that their seeds need fruit-eating birds (or sometimes other animals) to be imported, and second because the seeds of many species do not persist in the soil after they have been dispersed. These barriers can be overcome by closely-spaced biodiversity plantings of locally-native tree species, which rapidly grow to form a closed-canopy regenerating forest, provided that there is adequate site preparation (repeated treatments to kill the pasture grasses and associated herbs), use of advanced seedlings, and several years of subsequent actions to suppress grasses until a closed canopy has developed. But the financial cost is high, which means that only small areas of forest can be re-established using this method. A logical question, then, is whether the menu of potential restoration actions could be expanded to include some less intensive (and therefore less costly) interventions to accelerate reforestation. This was the starting point for the Kickstart trials - a proof-of-concept management experiment during 2012-2017, to test how much reforestation could be catalysed in retired pasture by stepwise interventions that addressed different ecological barriers to natural regeneration of rainforest seedlings. The trials took place at three sites on former grazing properties about 12 km south-west of Malanda, which we named CE, CW and RT. These sites were initially disused pasture with negligible tree regeneration, seven years after cattle had been excluded. At each site we established an 80 X 80 m area (the Works plot), within which all interventions took place, with one side adjoining a large tract of old-growth rainforest. Additionally each had a corresponding ungrazed pasture plot (with the same starting conditions but no interventions), together with a grazed pasture plot on a different property, to enable us to detect the effects of the interventions in the Works plots. For more than five years we kept records of all interventions, and monitored a variety of ecological outcomes. This article describes the main Kickstart interventions, and provides a preliminary overview of some of the outcomes and insights gained during the process. The intervention treatments in the Works plots had two main aims. First, we suppressed the pasture grasses and any other low-growing plants considered likely to inhibit regeneration of rainforest seedlings. Second, we encouraged seed-disperser birds by both retaining the scattered pre-existing native trees and shrubs and adding artificial perching structures. We mapped the locations of both these small native regrowth trees (21 across all Works plots) and of 11 scattered larger non-native shrubs (lantana, Lantana camara and tobacco, Solanum mauritianum), which we killed during the first treatment. Grass suppression required the greatest effort. CE and CW were dominated by tall (0.5-1 m) dense signal grass (brachiaria, Urochloa decumbens), while RT was blanketed by a tall (1-2 m) mix of Guinea grass (Megathyrsus maximus) and lantana. With minor variations, the first treatment consisted of a glyphosate spray to kill all pasture grasses and weeds, together with stem treatment (glyphosate or fluroxypyr) to kill the taller tobacco and lantana. Half of RT was first slashed with a tractor and then sprayed three months later - this proved to be the best initial strategy for the resistant lantana/Guinea grass mix. Grass treatments aimed to induce root death, to avoid rapid re-shooting and because root competition is a threat to seedling trees. Nine bird-attracting stations were added to each Works plot, each consisting of a perch, log and water basin. Perches were about 4m high with 3-5 short branches, constructed from sarsaparilla (Alphitonia petriei) trees. The first treatment produced a thick mulch of dead grass, but repeated herbicide sprays were subsequently needed to suppress both regrowth from surviving rootstock and further germination from soil-stored seed. Rather than adopt a fixed schedule of ongoing treatments, we made a rapid assessment of the state of each plot every 3-4 months, and then decided on the timing and nature of any subsequent actions. The herbicide shifted from broad-spectrum glyphosate to mainly grass-selective after the first year, to spare emerging native tree seedlings. We eventually settled on an adjusted concentration of Verdict (haloxyfop). During the second year, shading by an emerging tobacco canopy reduced the vigour of grass regrowth, so that subsequently the herbicide frequency decreased to 1-2 per year. In general, a high pressure hose and Quickspray unit achieved best grass suppression, but some less-accessible parts of plots required the use of backpack sprays. An early dilemma was how much effort to spend suppressing non-native herbs (including Ageratum and Crassocephalum), which germinated and grew vigorously when grasses were first removed. Over time we found that these herbs had their own cycles of growth and dieback even if left unsprayed, especially if shaded by the tobacco or emerging native tree species, and we concluded that it was not cost-effective to spray them. There were also occasional spot treatments of certain clearly undesirable weeds or vines. The CE site about two months (left) and then 4.5 years after the first herbicide treatment. Systematic bird surveys showed that by the end of the third year the emerging vegetation in the Works plots was beginning to create useful habitat for rainforest-specialist bird species (brown gerygone, bridled honeyeater, Bower's shrike-thrush, black-faced monarch, brown cuckoo-dove, and pale-yellow robin), which collectively were four times more abundant than in ungrazed pasture plots, which contained only the first two species (using the scattered lantana and Alphitonia shrubs). By this time the Works plots were also being regularly used by an increasing range of seed dispersers, with surveys recording four species (bridled and Lewin's honeyeaters, pied currawong and satin bowerbird) that both regularly eat fruit, and swallow larger seeds (more than 1 cm) without crushing and digesting them. Although the first three of these were also seen in the ungrazed pasture plots, they were half as abundant. Silvereyes were the most common seed disperser in both the Works and ungrazed pasture plots, but can only disperse small seeds (including those of lantana and wild tobacco). Native mammals seen, recorded by camera traps, or detected using other signs in the Works plots included pademelons and tree kangaroos (both of which also ate seedlings), striped possums (which fed on grubs extracted from wood of older tobacco trees), and brushtail possums. Seeds deposited in water basins beneath the bird perches were collected and identified monthly, with help from Cath Moran, when the plots were between one and 2.5 years old. These seeds included 31 different native rainforest tree/shrub species, from 15 plant Families, and most of these species had also been recorded from flora surveys in the adjacent old-growth forest. There were also many seeds of lantana and wild tobacco, and at least three other smaller Solanum species (the native S. aviculare and two non-natives, all having similar seeds). Most deposited seeds were contributed by tobacco, sarsaparilla, bleeding heart (Homalanthus novoguineensis), and Rhodomyrtus pervagata, all of which were common pasture trees in or near the plots, and which produce many small seeds. More species of native forest trees were deposited under perches that were close to either a paddock tree or the forest edge, reflecting the birds' typical behaviour of “perch-hopping” to avoid a lot of flying. The importance of perch sites (especially pasture trees and shrubs) for seed dispersal is also clear from the patterns of seedling recruitment. Among our records of native tree/shrub seedlings that had germinated and grown to at least 10 cm tall within the first five years in the Works plots, 45% were concentrated within two metres of pre-existing trees and shrubs, even though this was only 9% of the area searched. With the help of Catherine Pohlman and students from the School for Field Studies we conducted systematic seedling surveys on three occasions between 2012 and 2017, which yielded about 1,800 records of about 1,600 different recruited native trees or shrubs belonging to around 70 native species, together with around 4,700 measurements of recruited tobacco. The native seedlings were tagged with unique numbers and later re-measured if they survived. To fully digest and interpret the patterns of survival, growth and recruitment of these seedlings will require more time to analyse the data. One clear initial finding is that there were large differences between the three sites, as well as locally within each site. Nevertheless, overall, the diversity of native seedlings, their abundance, and the ratio of native to tobacco seedlings increased over time. In the first year, all seedlings were less than one metre tall, and about 17 species in total were recorded, but a few species dominated - especially bleeding hearts and sarsaparilla (with Dendrocnide, Glochidion, and Guioa also well represented). By the fifth year, there were about 65 species recorded, with a much more even spread of individuals. Among these, species of Dysoxylum, Polyscias, Rhodamnia and Wikstroemia showed large increases, as well as some tree-like tangles of cockspur (Maclura cochinchinensis). The species of seedling that recruited successfully corresponded only weakly with the seeds deposited. For example, laurels were less than 4% of all recorded recruits. These mainly appeared after the second year, and 97% of them were beneath pre-existing trees. In the fifth year the Works plots collectively had about 1,000 native seedlings (at least 10 cm tall) per hectare, with 20% of these exceeding 2 m in height. However all recruits located and tagged during the three surveys totalled about 2,000 per hectare. Since we did not survey seedlings in all years, this means that the overall survival rate of seedlings after they reached 10 cm tall must have been considerably less than 50%. Even though they dominated the early recruitment in two of the three sites, bleeding hearts experienced lowest survival (about 30%), compared with about 60% for sarsaparilla, but once a seedling reached about 50 cm tall, its chance of survival was much higher, and those that survived grew fast, achieving stem diameters of up to 15 cm. In contrast, the ungrazed pasture plots in their fifth year had about 200 native recruits per hectare, 6% of which exceeded 2 m, with a maximum stem diameter of 3.5 cm. Most small recruits in the ungrazed pasture were growing within lantana clumps at RT. The potential tree density in the Works plots would have been further increased if browsing by pademelons (Thylogale stigmatica) could have been prevented. Sheltering inside the forest during the day, and emerging at night to feed, pademelons are typically fearful of venturing far from the edge, but the developing tree cover within the Works plots gave them greater confidence. When we used electric fencing to exclude them in some experimental sub-areas, the survival of experimental bleeding heart seedlings was substantially increased. If browsed when small, the seedlings were either directly killed or were less able to grow rapidly or to resist death from adverse environmental conditions. Two newly tagged bleeding heart seedlings with a small Crassocephalum emerging through dead grass (left), and the impact of browsing by pademelons on a cluster of six seedlings (right), where five older individuals have been reduced to a section of lower stem and one younger seedling (top left) has so far escaped. What else have we learned so far and what does it mean for rainforest restoration? Overall, the Kickstart method has successfully replaced most of the pasture grasses with more diverse woody vegetation. In 2017, after about five years of treatment, substantial portions of both the CE and CW Works plots contained an increasing cover of native tree recruits up to about seven metres tall, some overtopping the 3-4 metre tobacco canopy. In contrast, the ungrazed pasture plots had undergone little change. Large parts of these Works plots are now on a regeneration trajectory towards becoming progressively more forest-like. Time will tell the extent to which future native regrowth has been further catalysed. Regeneration was least apparent at RT, where most native tree recruits were clumped near pre-existing trees, and there was more regrowth of lantana and tall Guinea grass. Clearly, some sites, and some parts of all sites, will do better than planned-for and others worse. Both the overall appearance of this Kickstart vegetation and the density of native saplings are clearly less forest-like than is the case for the best replanted sites aged 3-4 years (noting that potted seedlings and site preparation require an initial year). On the other hand, less money has been needed per hectare to achieve this outcome - a preliminary look at our records suggests that similar interventions would cost somewhere in the order of $12,000 per hectare. In biodiversity planting projects, the greater expenditure (at least three times this amount) and intensive actions accelerate the development of tree cover as well as reducing variability, and hence risk, in the outcomes at any site. For catalysing natural regeneration, our findings suggest that more use could be made of scattered paddock trees. These trees attract seed dispersers and native seedlings readily regenerate beneath them if the pasture grasses are suppressed with herbicide. Pasture trees are often well separated from the edges of remnant forest by open grass, so regenerating seedlings are less likely to be suppressed by pademelon browsing. Because these trees also shade the grass, less herbicide application is needed than is the case in areas of unshaded pasture. In treeless pasture, an alternative phased method of accelerating regeneration could be to plant clusters of 2-3 fast-growing pioneer species (such as sarsaparillas) that are also attractive to seed dispersing birds, to let them grow for several years, and then to spray the grass beneath their canopies. Such approaches are slower, less intensive, and relatively cheap; therefore could be suited to individual landholders on low budgets. A different kind of option could be to begin with the Kickstart method, for 3-4 years - sufficient to identify those parts of sites in which natural recruitment is low and grass regrowth most persistent. In these areas, intensive biodiversity planting could then be applied. This is the approach to be used at the CE and CW sites, where the least successful 25% of the Works plots will be planted-up in the 2018 wet season. Users of the basic Kickstart method as described above need to tolerate (or even welcome) the initial role played by certain non-native species such as the wild tobacco, whose function was to help shade out the pasture and attract seed-dispersing birds. The pre-existing native trees and the scattered tall tobacco and lantana shrubs had equivalent ecological roles - they did not differ in the numbers of native seedlings beneath them. As the tobacco canopy developed in the previously open areas, there was an increased recruitment of native seedlings beneath it, and in some experimental sub-areas where we killed these recruited tobacco trees there was no benefit in terms of increased seedling recruitment. This project has gone some way towards showing how the menu of alternative options for restoration might be expanded. Across a whole landscape we need a variety of potential options, to help choose the approach that best matches the timeframe and budget for each particular site. To further broaden this menu of different options, costs and ecological outcomes, there remains a large scope for adventurous trials that involve creative risk-taking with new methods. Whatever may be learnt in future to help in restoration, our work has also made it very clear that existing areas of remnant rainforest should not be felled, because even the best biodiversity plantings after two decades have recovered only a portion of the forest's biota. The CE site a few months before commencement, and five years later, as seen in Google Earth. The arrow indicates the location of the Works plot. Project funding and other resources were stretched from a variety of sources, including the authors' home organisations (Griffith University, University of Queensland, School for Field Studies), and also the Commonwealth Government, Tablelands Regional Council, Terrain, Norman Wettenhall Foundation, Toshiba and Conservation Volunteers Australia, facilitated by WTMA, TKMG, and TREAT. Many people, too numerous to list, have contributed in various ways to either site works or monitoring. Nothing would have been possible without the help and support of the landholders - Dave Hudson and Robyn Land at Cloudland (CE and CW sites), and Angela and Mark McCaffrey at Ringtail Crossing (RT). The recent findings reviewed here are yet to be published in scientific journals. A small garden of natives was planted at the nursery outside the TREAT office in May 2016, in memory of Joan and James Wright. It was always intended to have a plaque put there, and eventually a suitable piece of granite was obtained and a plaque attached, which reads 'In memory of Joan and James Wright, prominent co-founders of TREAT 1982'. Sandra Burchill embroidered the TREAT logo on a piece of floral brocade and this was used to officially unveil the plaque on Friday morning, 24th November 2017. 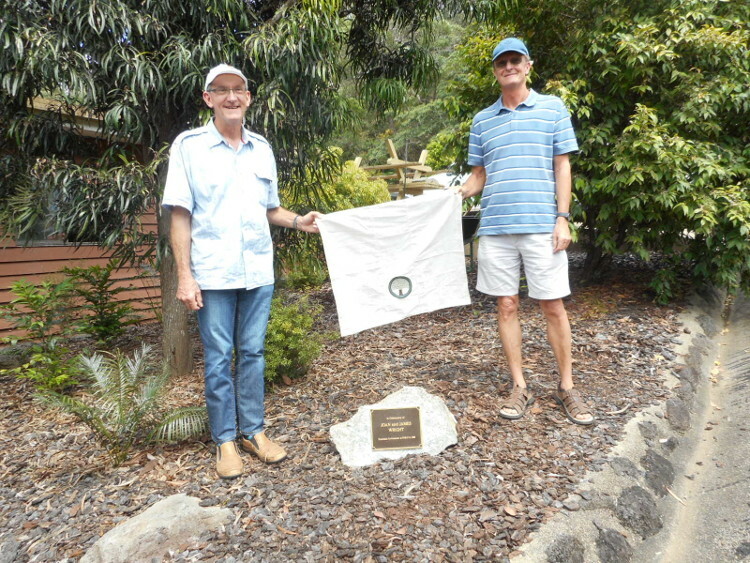 Joan and James' sons Tom and Anthony, came up from Cairns and Brisbane with their wives Heike and Margaret, to mark the occasion and lift the cloth from the plaque. They then planted a native Rhododendron in a raised area, to replace the first one which had died. They had brought up two special cakes, with decorated names Joan and James, and these were then cut and consumed at a second morning tea. Afterwards, Angela showed Tom and co. around the nursery. The Nature Refuge (NR) status of Ian Freeman's property came through after Ian had died and bequeathed the property to South Endeavour Trust (SET). In his memory it was named Freemans Forest Nature Refuge. Two signs are sent to the landholder when NR status is confirmed, and erecting them is a cause for celebration as achieving NR status is not easy. SET and TREAT arranged such an occasion at the property on 9th December, and about 60 people, including Ian's family from Brisbane, came to take part and see the signs erected. There were initial speeches from Angela, Keith Smith (NR advisor) and Tim Hughes (SET), then the first sign was erected near the property entrance. 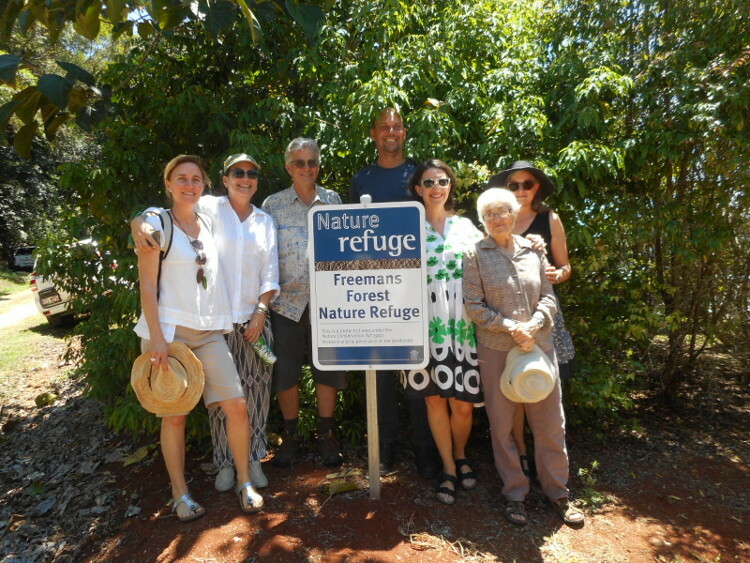 This was followed by a walk around the property to show what had been achieved since 2010 when Ian bought the place for revegetation, thereby linking the Peterson Creek Wildlife Corridor to the National Park at Lake Eacham. Mark McCaffrey has been doing the site preparation and maintenance of the recent plantings and he led the walk, sometimes through a closed canopy, with Peter Snodgrass and Angela assisting with information about the trees, dates of plantings and outcomes. Back up the hill from the swamp towards the shed, the second sign was erected where it can be easily seen from Lake Barrine Road. Then it was time to have a TREAT barbecue at the shed and this was organised by Elizabeth Hamilton-Shaw. After most of the food was consumed, Ian's youngest daughter Rowan read out a heart-warming poem written by her youngest daughter Bonnie in honour of her grandfather. It was indeed a memorable celebration. This was held at Ian Freeman's former property and 18 people came to learn about tree planting and the site preparation and maintenance involved. They were instructed by Mark and Angela McCaffrey, and Peter Snodgrass. 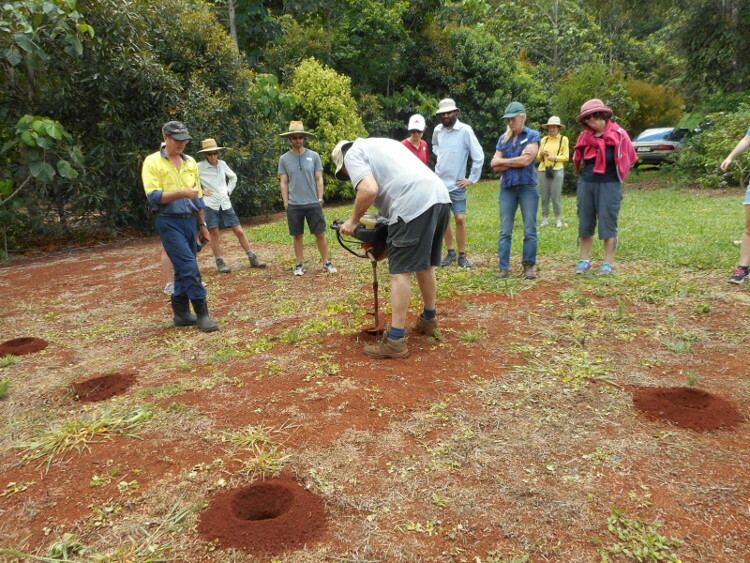 The demonstration site was close to the shed and this year, under Mark's supervision, several of the participants had a go at using the auger to dig holes. After listening to theory, planting and watering nearly 40 trees, they should now be able to plan and manage their own plantings with confidence. The swamp area on Freemans Forest Nature Refuge needed trees to replace some which had died after planting in 2015, and to extend the forest edge at the creek. On Friday morning 1st December, 17 volunteers planted 250 trees there before heading to the nursery for morning tea. The ground was drier than expected, so Peter went back to the nursery for an auger to dig holes. Some volunteers had brought shovels and a lot of holes were dug with these before Peter arrived back. The soil was mostly clay and it was not easy to dig holes or plant the trees, but they were all planted with fertiliser and mulched by 9.15am, thanks to so many volunteers turning up. 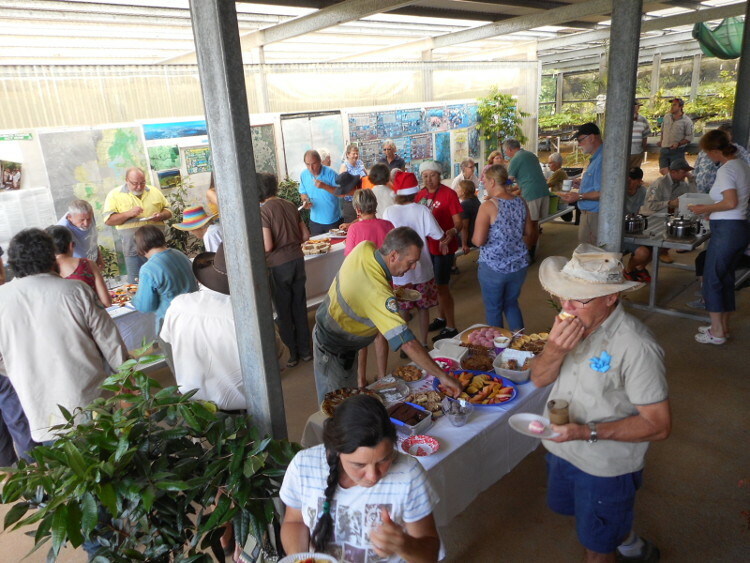 The Christmas party morning at the nursery was typically full of conviviality and food, with the staff from Lake Eacham Management Unit joining in, and it was nice to see a few people come along who don't usually make it to Friday mornings. Mandy Bormolini again organised the different platters bought with smoko money and the food brought by the volunteers, with plenty for everybody but little left over. TREAT receives a few cards at Christmas from former volunteers and others, and this year we had a card to read out from 'Piggy', sent via 'Siggy'. We all miss Piggy and his wonderful humour, so this was special. Besides sending us Christmas wishes and noting how much he had enjoyed showing us his woodwork on Friday mornings, he sent $6,000 from the sale of his ute, to give something back to TREAT. We were very touched as he had already given us so much with his personality and volunteering. The festivities progressed to Geoff Errey's reading of his latest poem 'In Memory of Memory'. It gave us many laughs, especially as a lot of us could relate to it. Hopefully there will be room to print it in the next newsletter. Peter then read out Bonnie's poem from the Nature Refuge celebration and the morning ended with everything cleared away by 11am. Seed collections have vastly improved this season with most of the regular, sought after species suitable for revegetation, available in good quantities - see Fruit Collection Diary. November was the month for our annual workshops on plant identification, propagation and tree planting, though this year we decided to cancel the plant identification and propagation workshop as we felt the content needed to be refreshed and brought up to date. Plans are to hold this workshop in its new format in November 2018. The tree planting workshop was held on Saturday 18th November at Freemans Forest Nature Refuge, with Peter Snodgrass, Mark and Angela McCaffrey once again covering all aspects of site preparation, tree planting and maintenance. Milder weather conditions prevailed than in previous years. If you are planning your own planting project this season, we would like to encourage you to arrange to collect your trees from the nursery during January and February if possible. March will be a busy time for us preparing and planting larger TREAT and QPWS projects throughout the month, so get in early if you can. With any luck the Bureau of Meteorology's rainfall outlook should see us with a reasonable chance of decent planting conditions over the next couple of months.